A dangerous gangster has just escaped from prison in The target. He is terrorising the city because a client will give him money for every crime he commits. 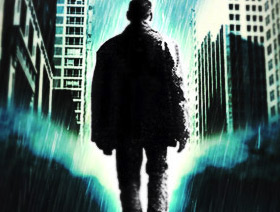 Three policemen are sent to catch the man before he has managed to collect Euro 1,000,000 and he leaves the city. The gangster has to steal (virtual) objects that are located all over the city to be able to commit the crimes: a knife, a rope ladder, explosives, etc. Every time he steals an object or commits a crime, however, the police find out. This ensures the gangster leaves a trail of his activities in the city that can be followed. The police satellites also succeed in exactly localising the gangster every 6 minutes and the policemen can continuously check how far away they are from their "target" (the gangster). Will the police succeed in disabling the gangster before he has achieved his goal? La mosca is a publisher of city games. These games are location-based games, city games where your position is a determining factor. Kristof van den Branden started La mosca in 2006 after ten years experience as an Internet Consultant and as a (web) editor/reporter. He already had the idea of the city games in 1998 as a passionate board game player. He only thought the time had come to give shape to the concept in 2005. This resulted in The Target going into production by the end of that year (the first La mosca game). 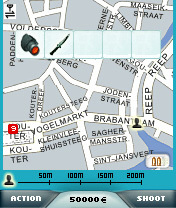 The Target and the second game (CityTracks) were ready at the start of 2007.